Spring is a busy time in the world of birds. It is a time to build nests, lay eggs and raise the young. 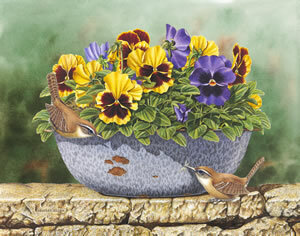 It is an especially busy time for the male Carolina Wren who may build three or four stick and twig nests in shrubs or mail boxes or a dish pan garden of pansies like the one shown here, before his mate decides on the one that will be home to her family. Perhaps, in this case, she wants her hatchlings first view of the world they will live in to be filled with the color and beauty of flowers in full bloom. 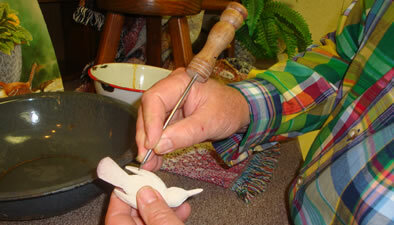 As he does on many of his paintings, Dempsey created life sized, clay sculptures of the birds to use as props during the process of creating the painting. 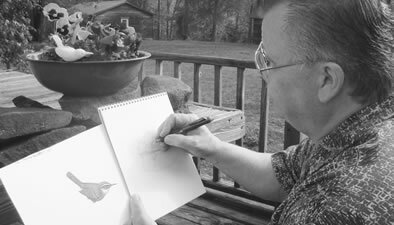 Since it is impossible to convince the birds themselves to hold a pose, Dempsey molds, by hand, life size models of the birds in the pose he plans to use in the painting. The sculptured models are very lifelike and contribute greatly to the reality and overall beauty of the finished painting.